It’s no secret that I love fried foods, enough to eat it at least three or four times a week. 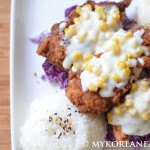 Fried chicken is my usual go-to meal either delivered or cooked at home, but another dish that I can’t get enough of is tangsuyuk (sweet n sour pork), a classic Korean-Chinese dish that is a favorite among kids and adults. Traditionally made with pork, I decided to substitute it with a healthier, kid-friendly option: chicken breast. The cooking instructions are practically the same, with the final results being crispy pieces of chicken in a sweet, tart, and sour sauce filled with hearty veggies. 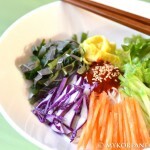 It’s been about three years since I last did my tangsuyuk recipe, so make sure to give this time-tested recipe a try. 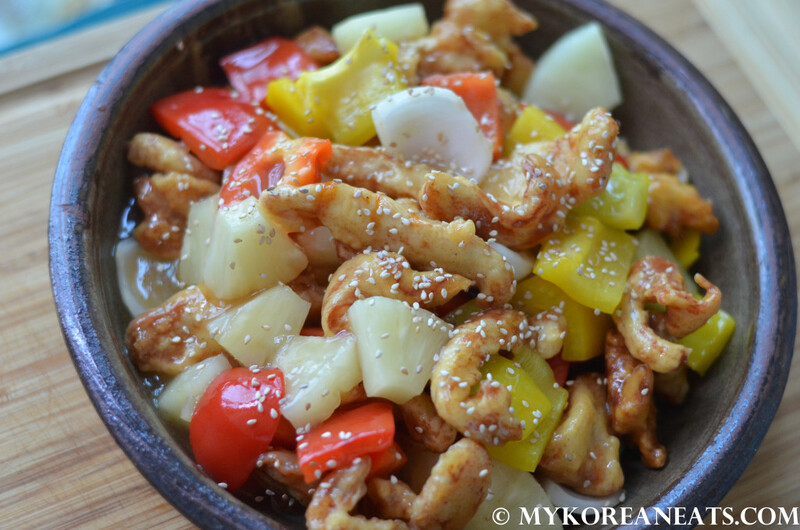 Tangsuyuk (sweet n sour pork), jajangmyun (black bean noodles), bokkeumbap (fried rice), and jjambbong (spicy seafood noodle soup)—by far the most popular fast-food dishes in Korea—are Chinese in origin but have a distinct and modified Korean taste to them. They have been around in Korea for such a long time that it’s quite possible that the current generation of youth might even think of them as uniquely Korean. Regardless, joonghwa yori (aka Korean-Chinese cuisine) will always be my Achilles heel because it’s just so quick, addicting, and relatively cheap—a winning combination in my book. A short anecdote: I still remember hearing and seeing the insane delivery guys on motorbikes weaving in and out of traffic trying to deliver their meals as fast as possible. And lucky me, I got to meet one of them personally as a delivery guy blindsided my Honda motorbike. Despite suffering some scratches on my bike, it was hard to berate the guy simply because he immediately began apologizing and bowing at 90 degrees in a show of forgiveness. Since I came away from the incident unscathed, I let him go do his thing and advised him to drive safely. He sped off faster than our initial encounter. Thinking back, I guess this might be the reason why I no longer visit the Kangnam area anymore….specifically the intersection next to Kyobo Bookstore. 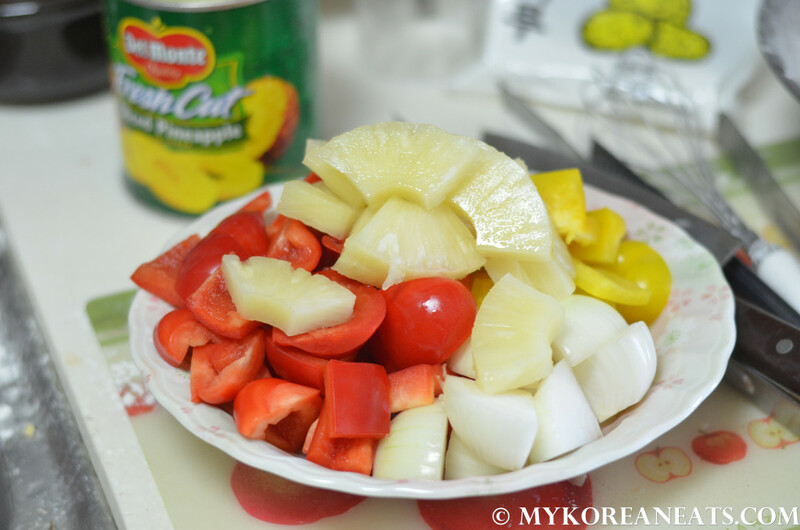 Most of the ingredients for this chicken tangsuyuk recipe: chicken breast, diced peppers, onion, and pineapple chunks. After cutting the chicken into thin strips, season with salt and pepper. Prep your vegetables accordingly. Include vegetables or fruit (apple is ideal) to your liking. 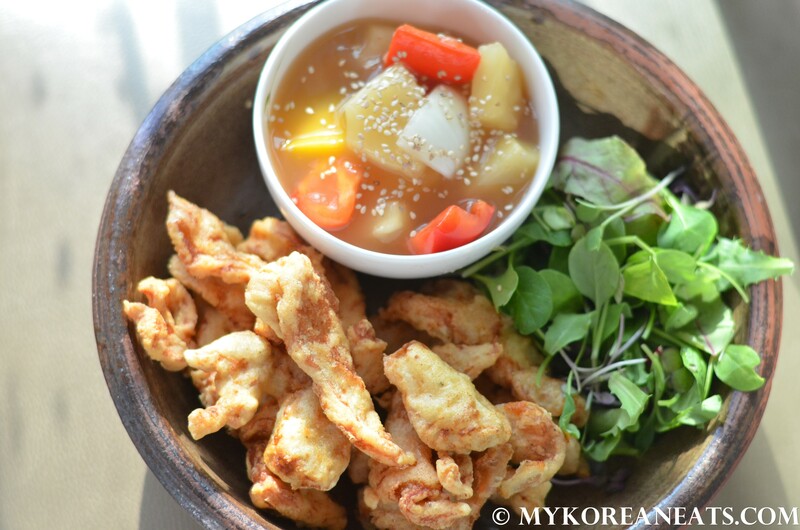 Ear mushrooms and cucumbers are populars ingredient with many traditional tansuyuk dishes here in Seoul. Dust in cornstarch and shake off excess by hand. In a light batter consisting of cornstarch, flour, egg white, and seasoning, make sure to coat the pieces completely before frying. 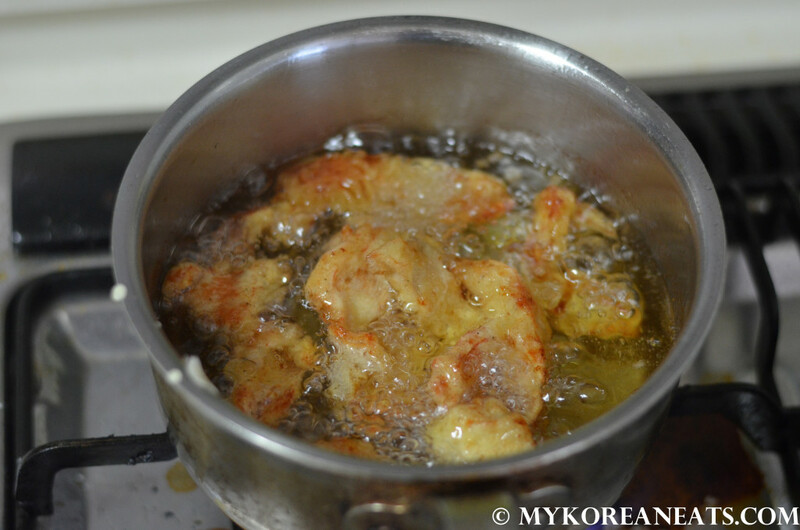 Deep fry the pieces for about 5 or 6 minutes, or until it turns a golden brown. Dry on a wire rack or paper towel lined platter. 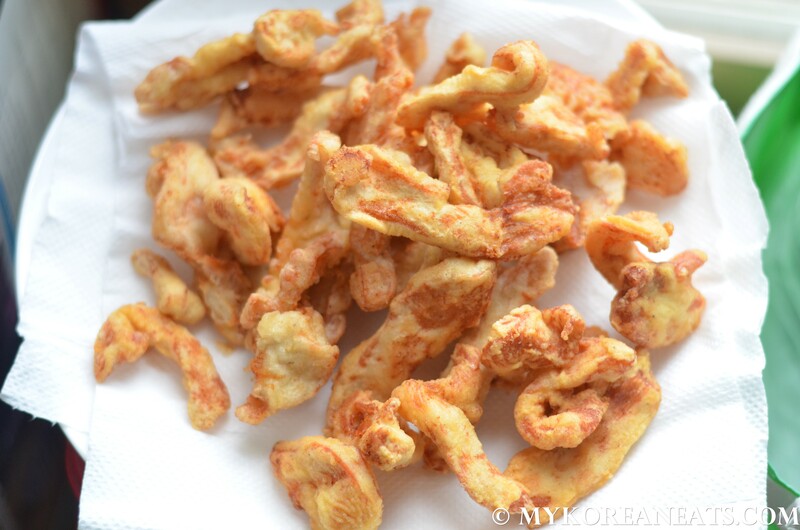 For extra crispiness, fan dry them to remove excess oil. Mix sauce ingredients (water, sugar, vinegar, pineapple juice, salt n pepper) together using cornstarch water as a thickening agent. Throw in the hard veggies for a few minutes and remove from heat. Mix everything together and enjoy while hot! Some people prefer to eat the fried pieces separately from the sauce, so I made two batches for the picky eaters in the house. *Extra light olive oil and sunflower oil are great options to use when you deep-fry foods. They have a high smoke point and heart-healthy unsaturated fats. Other good options include safflower and peanut oils. Cut the chicken into thin strips, about 1 or 2-inch pieces. Season with salt n pepper, set aside for 10 mins. Cut the vegetables into large bite-sized pieces. Set aside until the sauce is ready. Make batter by mixing the flour, cornstarch, water and egg white. Mix until the batter has a light, runny consistency. Coat the chicken pieces in cornstarch, dust off any excess starch, and then dip into the batter until fully coated. Bring canola oil to medium high heat (or approx. 350 degrees). Deep fry each of the strips for about 5 minutes for each batch or until golden brown and cooked through. When finished, place on paper towel-lined dish or wire rack to remove excess oil. Fan dry them for extra crispiness. 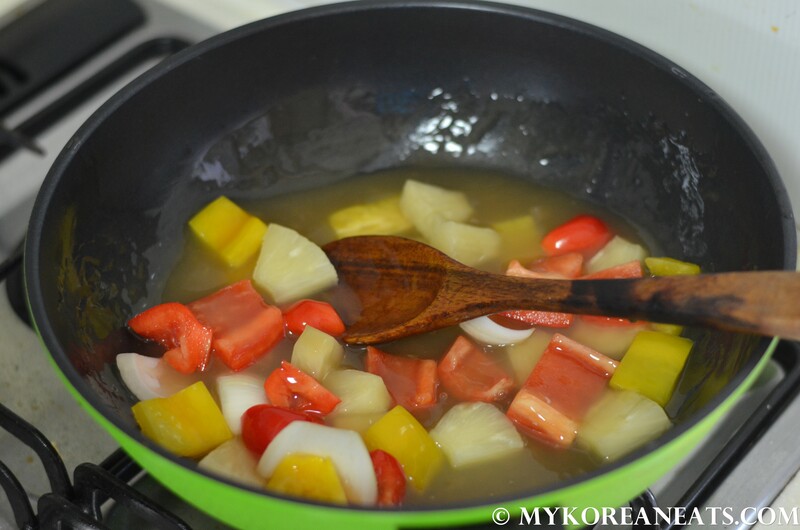 To make the sauce bring the sauce ingredients in a small pan, minus the cornstarch + water mixture. Bring to a rapid boil until sugar dissolves, then add the mixture of cornstarch and water. Reduce to low while stirring until thickened. Sample and adjust accordingly. Add desired vegetables and let simmer for a few minutes. 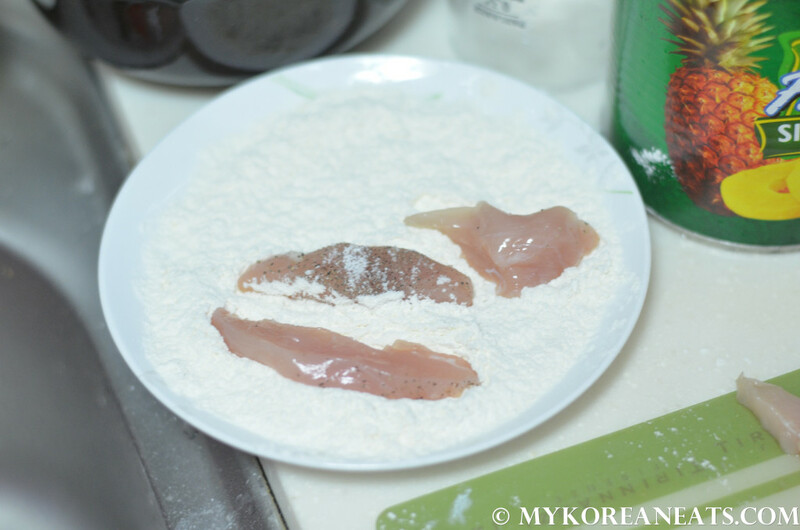 Combine chicken and sauce together before transferring to a plate, or serve separately depending on preference. Happy eating! 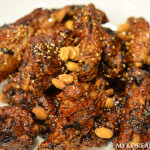 Next Post Jeju Bulbaek 제주 불백 + Are You Eating Well? 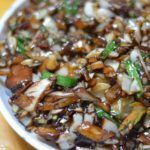 밥은 먹고 다니냐?